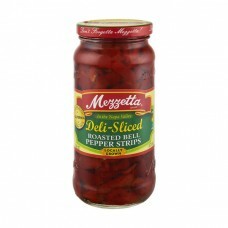 Provider: G L Mezzetta Inc.
Mezzetta® Brand Deli-Sliced Roasted Bell Pepper Strips. Don't forgetta Mezzetta! Hand selected. California. Fresh pack. In the Napa Valley. Locally grown. 16 fl oz (473 ml). Family owned & operated. Fine quality since 1935. Gluten free. Mezzetta enjoys long-standing relationships with many local family farms in northern California. This allows us to hand select only the best peppers from each crop. From the sun-drenched fields to our Napa valley facility, these peppers are packed within 24 hours of harvest. Enjoy. Please recycle. Picked and packed locally. Add to pasta or potato salad. Add to focaccia bread and pizza. Add to omelettes, scrambled eggs or grilled cheese sandwiches. Wonder what else you can do with these delicious roasted bell peppers? Visit mezzetta.com/bellpepper. Mezzetta packaging is 100% recyclable. Important: this is an all-natural product. Refrigerate after opening. Consume within seven days or freeze in a plastic container. Consume within seven days or freeze in a plastic container.